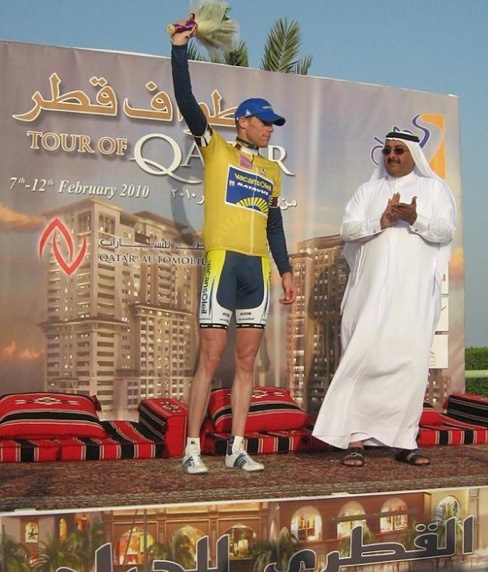 Chicchi takes stage, Mol wins overall in Qatar. A farewell to the Belgium of the dunes. Uhh, where's the podium girls? Allah is great and so is cycling. Welcome back to the land of Q. A true statement except during the Tour of Qatar when the top riders and teams show up to teach the cars and camels a few lessons. Today in stage 6, the finale of this year’s tour, it was Francesco Chicchi (Liquigas) who instructed everyone on how to win a sprint finish. After seven laps of a 6km circuit in downtown Doha, the Italian burst up the left side of the road when every other sprinter in the Middle East went right to cut the corner. On paper, the wrong decision but on the podium the right one, as he beat Tyler Farrar (Garmin-Transitions) and Juan Jose Haedo (Saxo Bank). “I stayed on the left because it was sheltered from the wind. I took a risk by doing that but everyone else went to the right to take the shortest line. I took the long way round and got it. I hit 74kpm, that’s how fast the sprint was,” said Chicchi. “It’s usually harder for me to win high-speed sprints like this but Bennati sacrificed his chances to help me and I can only thank him.” Twisted Spoke thinks the duty free shop at the Doha airport might be an excellent place to pick up a thank-you gift for Bennati. The big surprise was overall winner Wouter Mol of Vacansoliel, who finished in the bunch to win his first race of note. Combined with two wins by their sprinter Borut Bozic in Etoile de Besseges last week, Vacansoleil is off to a flying start. Chapeau, team of the Sunny Vacationers. “I’m really happy now. I’m getting better as a rider. I’ve never done this kind of thing before, I hope I can do it some more times in the future,” said Wouter. Much of the race from Al Wakra to Doha Corniche was animated by a four-rider break. Patrick Gretsch (HTC-Columbia), Martin Kohler (BMC), Niki Terpstra (Milram) and Australian Ben King (Trek-Livestrong) took off just 2.5km into the stage. Their lead went up to five minutes and then rewound to zero in the closing circuit. And so we must bid a fond and dusty farewell to the Land of Q and the week-long cycling frenzy that turns the country into the Belgium of the sand dunes. To those who already feel the withdrawal pains, we say fear not. Thanks to the Sultanate of Oman, their tour begins in two days with an exciting twist: camels, sand dunes and … mountains. Who needs Italy and Spain and France? The caravan to exotic capital city Muscat leaves tonight. Load the Pinarellos — there’s not a moment to lose. « A magical ride around Doha, Qatar. A short film by Jabiz Raisdana. Ha, you knew all along! You wrote a piece about how Vacansoleil have them crazy names that would confuse the peloton. Now SKY and everybody else lose it when Wouter goes on a break and takes the overall. And that after the 2 wins by Borut in Besseges. Henkio, we have all sorts of predictive tools at TS. How did you like that little video of the guy riding around Qatar? There was something really sweet about it.